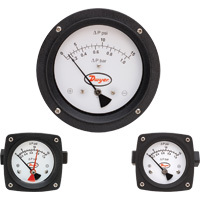 Explosion-proof Series H3 Explosion-Proof Differential Pressure Switch, heavy duty, industrial unit has a unique new design which provides sensitivity to differential pressures as low as 10 inches of water (254 mm w.c.), yet handles total pressure of 1500 psi (103 bar). 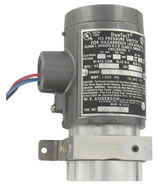 Unlike common differential pressure switches that use a piston-type motion transfer, the Series H3 utilizes a rotary motion transfer shaft that prevents a change in total pressure from causing a setpoint shift. Unit yields deadbands approximately 5% of range, with zero setpoint shift due to variation in working pressures. Friction is minimized and repeatability increased by allowing range spring to act directly on diaphragm plate. Rolling diaphragm design maintains constant effective area to further reduce friction. Diaphragm is allowed to “seat”, allowing application of full rated pressure, up to 1500 psi (103 bar), on either high or low pressure port, without damage. 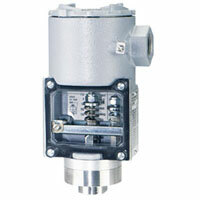 Special over-travel feature prevents overtightening of range adjust screw. 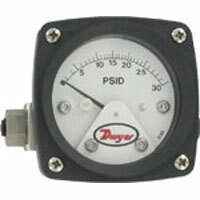 Choose optional 316SS chamber for water and water-based fluids or harsher applications. Water flow proving with an orifice plate. 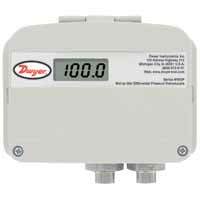 Perfect for monitoring differential water pressure on filters, chiller coils, and flow elements. -4 to 220°F (-20 to 104°C). 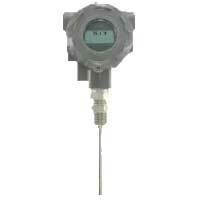 ATEX: -4 to 194°F (-20 to 90°C). Standard meets NEMA 4X (IP56); Drain option meets NEMA 3 (IP54). For hazardous use see "Hazardous Location Ratings Chart" on Catalog page. 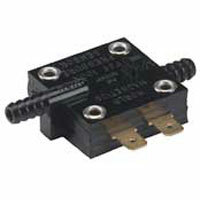 SPDT or DPDT snap switch. 5 A @ 125/250 VAC, 30 VDC. 4 lb 2 oz (2 kg). ATEX (see "Ratings Chart" on catalog page), CE, CSA, UL. EXAMPLE H3 A 1 S C MV Series H3A-1SC-MV Explosion-proof, Weatherproof Differential Pressure Switch, aluminum chamber, nitrile diaphragm, range 10-180" w.c., SPDT snap switch, terminal block, ATEX approved, with gold contacts on snap switch. 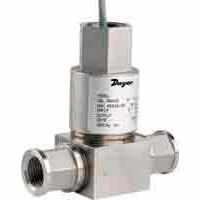 For which pressure switch applications are gold contacts recommended? 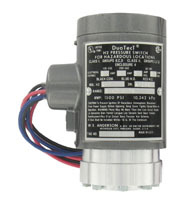 For "dry circuit" applications where little or no current is flowing in the circuit to help burn off contact dirt and oxidation. 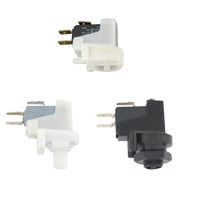 Switches used with solid state circuits often fall in this category.